Working hand in hand with the architect, Alison Friedricks Interiors was called upon for their expertise as luxury design consultants to transform this 1990’s Goldens Bridge contemporary into a traditional English home with an open floor plan. 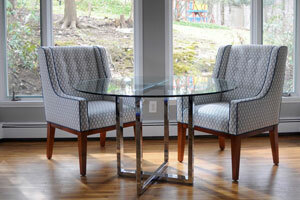 The original dining area was transformed into a casual sitting room. Barn doors set the stage for family gatherings in a new great room that blends rich fabrics and tones with a splash of English charm. The master bedroom suite is a soothing oasis in tan and powder blue with a custom headboard, bedding and benches and a sitting area in a mix of stripes and solids. The master bath beckons with a standalone tub, custom painted cabinets and a make-up vanity in crisp white offsetting navy wallpaper and a soft gray tone for the double height ceiling.